Shown below is a pre-operative and post-operative picture of a bimalleolar ankle fracture of a 72-year-old female who fell in her home. The ankle joint consists of three bones called the talus, tibia and fibula. The joint connects the lower leg to the foot. The ankle joint allows us to move up and down during walking and running. It also allows a slight turning in and out during most sporting activities. These bones are connected by ligaments. Ligaments connect the bones together and prevent the bones from separating perfectly. There are five ligaments on the inside of the ankle, three on the outside and four that connect the two lower leg bones called the tibia and fibula. Tendons cross the ankle in the front, back, inside and outside. These tendons allow the ankle and toes to move during walking and running. 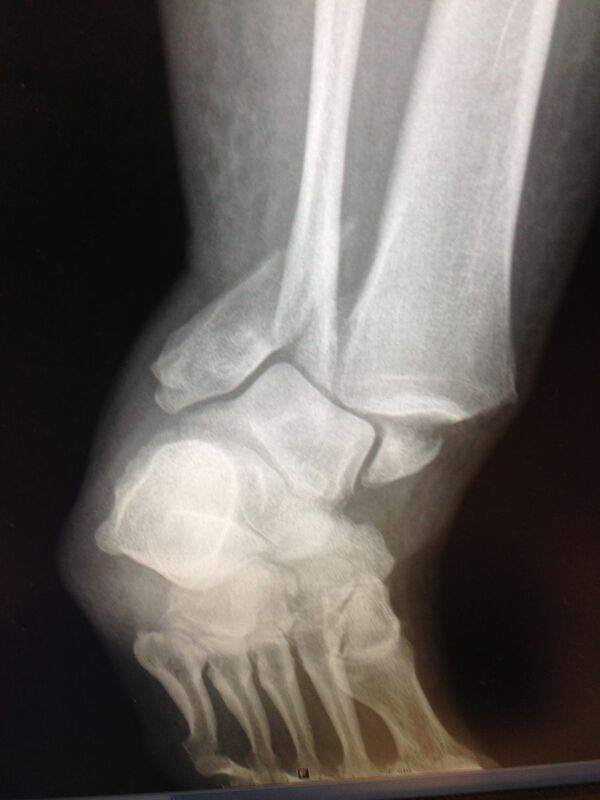 Fractures of the ankle occur most commonly from excessive rotation of the foot relative to the lower leg. This rotation can occur with simple injuries such as falling off of a step or even a shoe. It can occur from excessive rotation when stepping out of a car. They are more common in sports when the foot goes in one direction and the leg goes in the other. 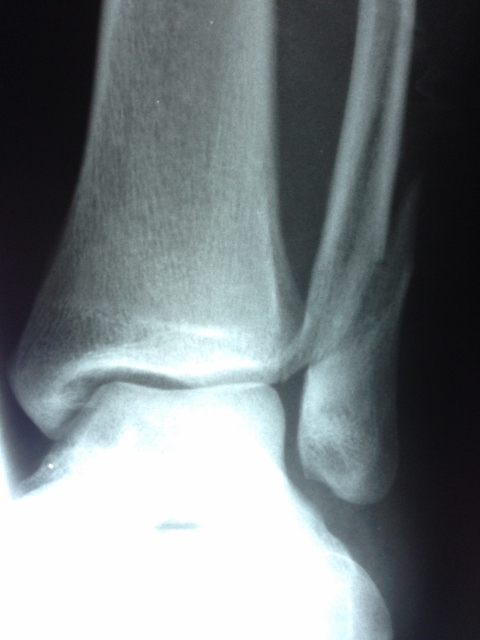 Fractures can also occur due to direct trauma to the ankle from getting hit on the inside or outside of the ankle. Fractures can also occur when falling from a height and landing directly on the bone itself. There are many different patterns of ankle fractures. Fractures can affect the outer bone called the fibula, which would be then called a lateral malleolar fracture. 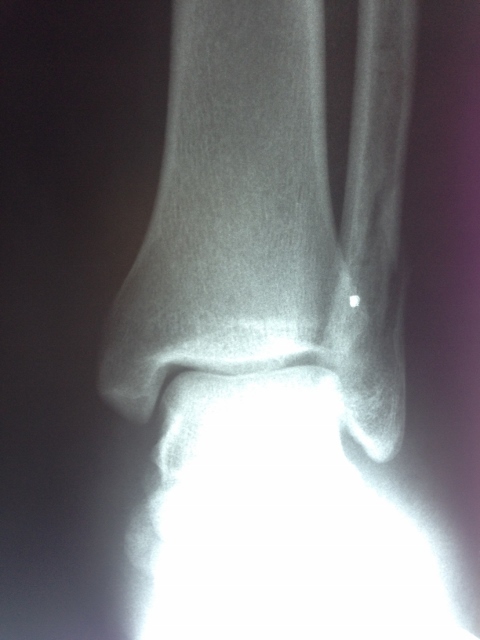 Fractures can affect the inner ankle bone only which we would call the medial malleolar fracture. 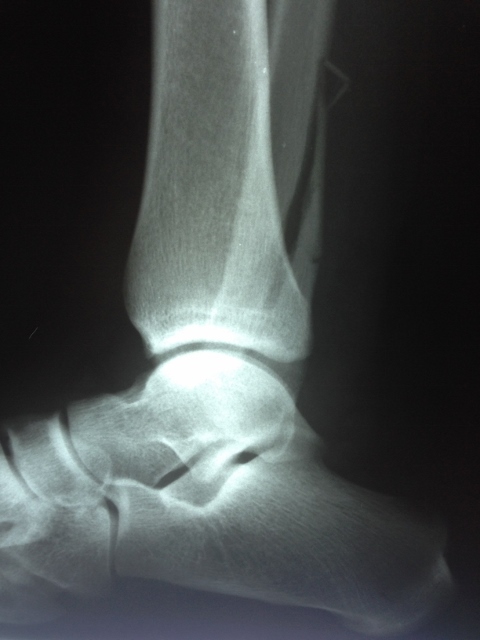 Fractures can also occur in three areas of the ankle joint called a trimalleolar fracture. Fractures that go right through the joint and cause complete disruption of the joint are often called pilon fractures. Fractures to the ankle are almost always accompanied by ligament injuries. Fractures do have a pattern that helps the physician identify the mechanism of injury that assists the doctor in treating the problem. OPEN FRACTURES are injuries that are not only called a break in the ankle bones but also an opening of the skin to which the bone points through. 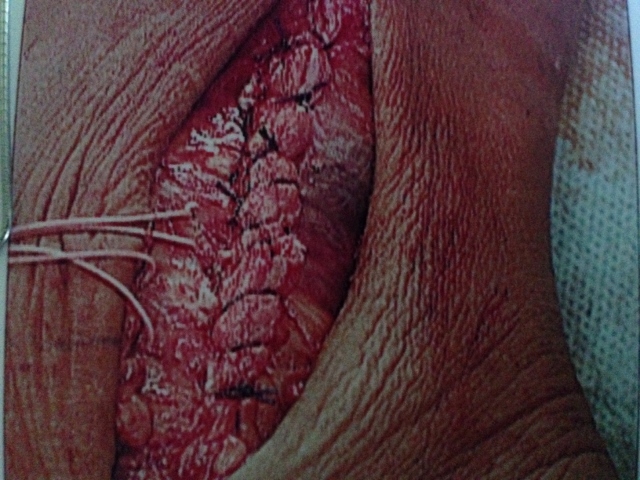 These are surgical emergencies that need to be treated immediately to avoid both soft tissue and bone infections and prevent long-term problems. SIGNS AND SYMPTOMS of ankle fractures are usually very clear. During the injury the patient may feel a pop, snap or crack. There will be immediate swelling that will be diffuse to the area of the ankle that has been injured. There will be some discoloration and at times deformity if the fracture is displaced. There will be a complete inability to weightbear in almost all cases on the affected area. In some cases there will be a compromise to the nerves and the arteries around the ankle area. Patient may experience a significant amount of numbness and tingling that develops in the foot. X-RAYS are important to assess the overall injury. In some cases x-rays do not show the entire deformity and CT scans and/or MRIs are necessary to fully evaluate the area. Stress views are x-rays that are taken with the foot slightly manipulated to further evaluate the injury. They give us information regarding the ligaments that had been injured during the trauma. TREATMENT: Treatment of ankle fractures depends on the degree of injury to the soft tissue, ligaments and bones. Nondisplaced fractures can be treated effectively by a nonweightbearing cast in most cases. This may be necessary for a period of 6-8 weeks. Some fractures are stable and can be treated with a walking cast. Fractures that are more displaced may require closed manipulation and casting. Sometimes this can be done in the physician’s office. At other times it may be necessary to have a general anesthetic to relax the muscles and allow manipulation of the bones into their proper position. At times this is accompanied by percutaneous pins or screws placed through the fracture site to give the fracture stability. When fractures are grossly malaligned and the joint cannot be put into its normal position surgery is performed to place the bones and ligaments into their normal anatomical position. 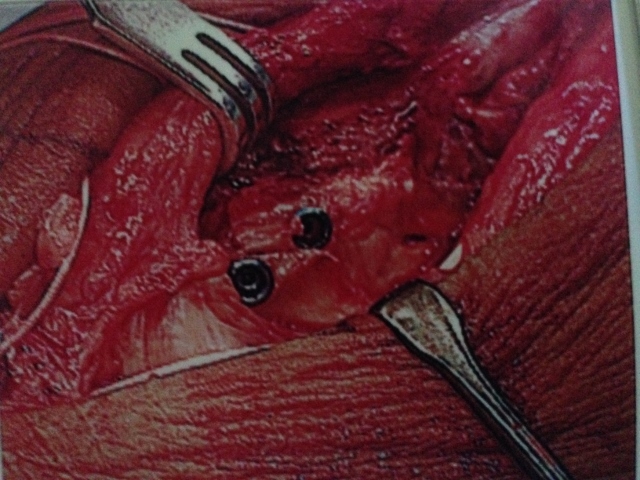 The procedure is called an open reduction and internal fixation. These procedures are done in most cases under a general anesthetic. Incisions are placed over the affected bone and small screws and plates are placed onto the bone to stabilize and fix the fracture. 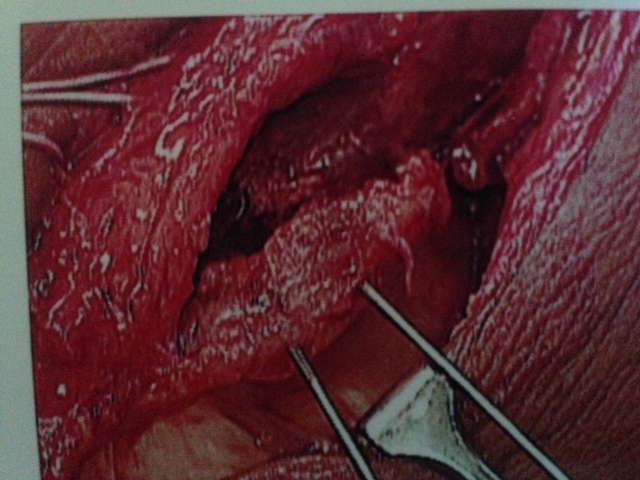 Sometimes ligaments may be repaired during the procedure. Ligaments would be fixed if expected to have ankle instability following the injury. PROGNOSIS: The prognosis of ankle fractures is dependent on the degree of injury. The more of the joint that has been affected determines the prognosis. High energy injuries to the ankle would cause more disruption to the joint surface. High energy injuries are commonly found in patients falling from a significant height or getting in a motor vehicle accident. The worse the cartilage damage at the time of injury, the worse the long-term prognosis. Isolated fractures of the bones that have minimal to no disruption of the joint surface have an excellent long-term prognosis provided that there is excellent anatomic position of the fractures. In most cases the hardware placed on the bones can be left in the area unless they cause discomfort following the healing process. Patients with ankle fractures are not uncommon. Chronic stiffness and pain in the joint can develop even after a perfect anatomic reduction and internal fixation. This is due to some disruption of the joint surface and the lining of the joint. This can be treated arthroscopically in most cases to lessen stiffness and pain and improve range of motion. Malunions can develop in the joint in which the bones do not heal in their perfect anatomical position. This can be corrected following the healing process. It is expected that the prognosis would be worse and arthritis would set in. Delayed union or nonunion are relatively uncommon following ankle fractures. If during the healing process the fractures appear to be healing very slowly, bone stimulators may be necessary to enhance healing. If the fracture goes on to a nonunion, surgery may be necessary to freshen the fracture and try fixation to stabilize the fracture and allow it to go on to uneventful healing. 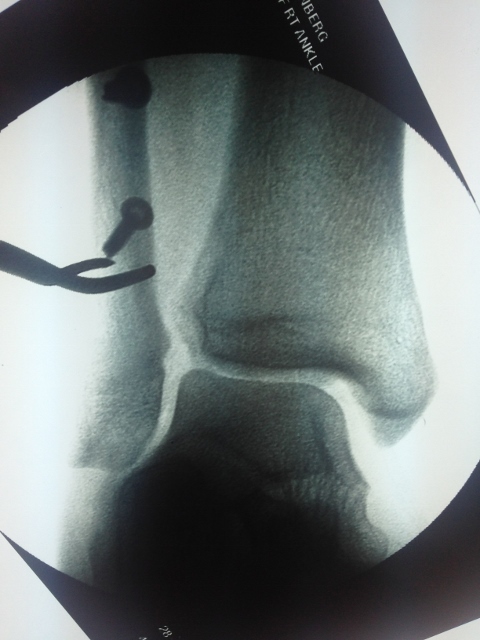 If the fracture has completely disrupted the joint surface (pilon fracture) then at some point arthritis would set in, which may necessitate surgical procedures which can include an arthroscopy, total ankle replacement or an ankle fusion. The x-rays below demonstrate a lateral malleolar fracture that is displaced and has shortening which requires surgical repair (left). 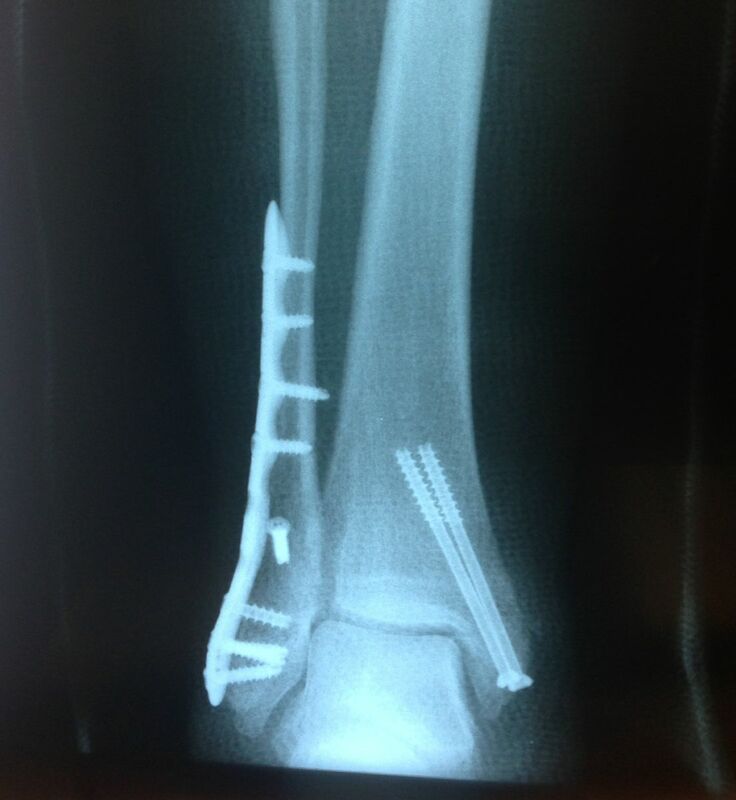 Post-surgical repair with open reduction of the fracture with internal fixation involving screws and plate (right) allow re-alignment of the fracture fragments will allow the bones to heal correctly and in a timely fashion. The x-ray image below is that of a non-displaced lateral malleolar fracture that will heal well without surgery. The patient must be immobilized and kept non-weightbearing in a cast depending on various factors including age of patient and pain level. Some patients do well with weightbearing protected immobilization in a cast boot. Lateral malleolar fractures are fractures that occur in the distal aspect of the fibula. They can be distal, at or proximal to the joint line of the ankle. If non-displaced and stable, these fractures can be treated non-operatively with cast immobilization. 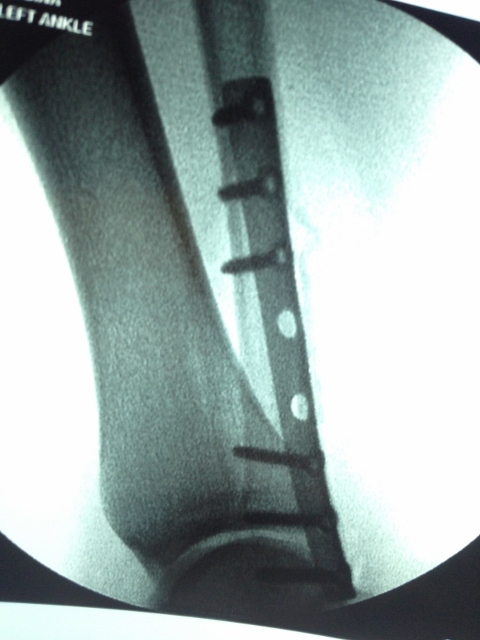 Usually, 4-8 weeks nonweightbearing followed by protected weightbearing with a cast. Then a Cam Walker and physical therapy is initiated. If unstable, and/or displaced, these fractures need to be brought to the OR to have open reduction and internal fixation (ORIF). Usually, a plate and screws are utilized. Six to eight weeks of a nonweightbearing cast followed by Cam Walker and physical therapy. Studies have shown a fibular fracture displaced by 1 mm can decrease the contact area of the ankle joint by 42%. If there is a small avulsion fracture off the tip of the fibula, these can often be treated by weightbearing cast immobilization followed by Cam Walker and physical therapy. 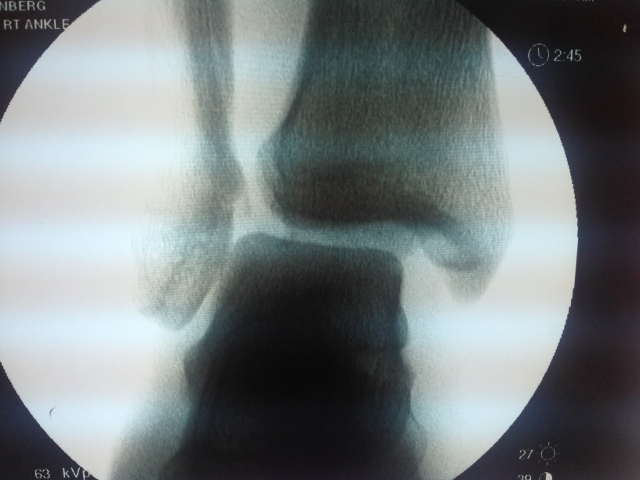 This is a picture of a healed high fibular fracture with fracture callus surrounding the fracture site. 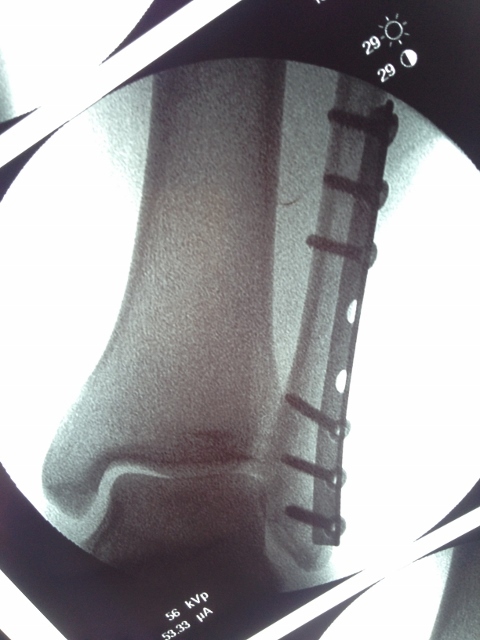 X-ray is post repair of fibular fracture with plate and screws with a syndesomotic screw. Now, the ankle joint is anatomic and symmetrical. 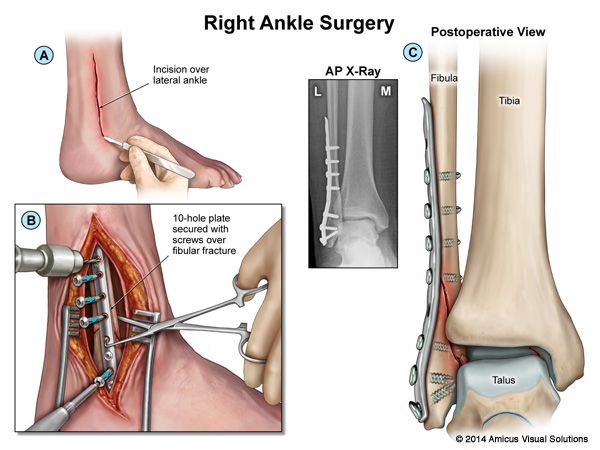 A plate and screws is placed on the fibula after reduction and 2 Arthrex tightropes are placed across the syndesmosis to maintain reduction. This can be seen as the two "buttons" on the right side of the x-rays on the tibia. 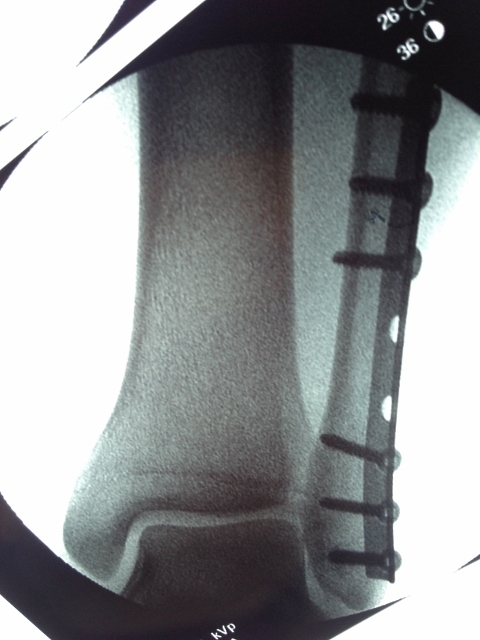 Preop and Postop Fibula Fracture ORIF with Syndesmotic Rupture. The patient had a temporary screw placed across the syndesmosis for 12-16 weeks and then permanently implanted an Arthrex Tightrope to maintain stability but allow physiologic motion. This is a fibular fracture that had deltoid rupture that causes the increased space at the inside (medial) ankle. The joint should be congruous and symmetical. After repair of the fibula, an instrument is placed around the fibula and there is traction applied laterally to check the integrity of the syndesmosis. If there is widening of the syndesmosis with lateral pull of the fibula, the test is positive for syndesmotic rupture and will necessitate stabilization of the syndesmosis. 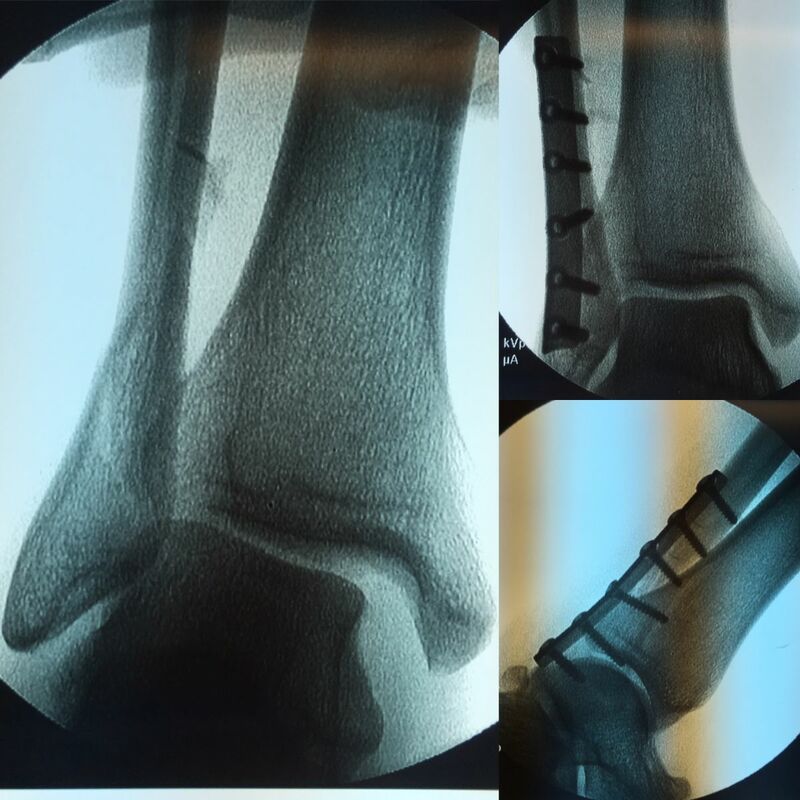 A straight oblique fracture throughout the medial malleolus (left) was repaired with percutaneous minimally invasive surgery with two surgical screws (right) that allow reductions and better healing of the fracture. This also will secure the ankle joint along the fracture site to reduce the risk of arthritis at a later time. Medial malleolar fractures result from direct impact to the talus or from tension as the talus rotates or moves laterally following the fibula. A medial malleolar equivalent fracture is when the deep fibers of the deltoid ligament tear, but the bone remains intact. The anterior colliculus portion of the medial malleolus may be avulsed by the superficial fibers of the deltoid ligament. The deep fibers may remain intact or rupture. A fracture above the level of the ligamentous attachment leaves the deltoid ligament attached to the distal malleolar fragment. If non-displaced and no other associated fracture, these can be treated sometimes non-surgically with a nonweightbearing cast followed by Cam Walker and physical therapy. 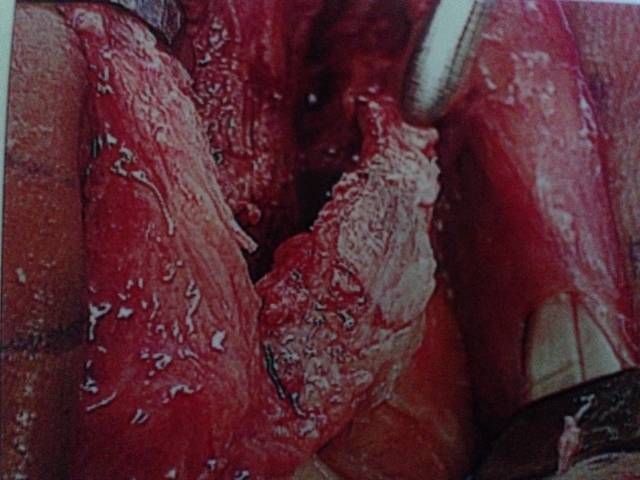 If displaced, then surgery is required to make the fracture anatomic. Usually, at least two types of fixation will be utilized to reduce any rotation. Fixation includes screws, screw and/or pin, pins or tension band if applicable. The x-rays below demonstrate both pre and post-operative repair of a medial malleolar fracture. The surgical repair was performed with open reduction and internal fixation of the fracture fragments with two surgical screws.